Tulip season has finally arrived in the Northeast! After a long winter, and this past winter being much longer than most, seeing the arrival of tulips is like seeing nature’s exclamation points (upside down)! 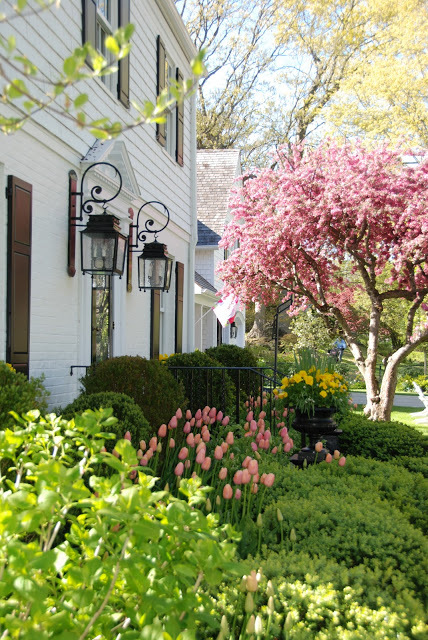 My blog is named Pretty Pink Tulips, after the more than 1000 pink tulips that surround my house each Spring. My outdoor “signature”, so to speak. And, lucky me….they always seem to arrive in time for Mother’s Day. Nature’s bouquet! Home is very important to me. I grew up in Texas, the daughter of a minister, and my family always lived in houses owned by the churches that my father served. So, for all my growing up years, it was always in “someone else’s home”. 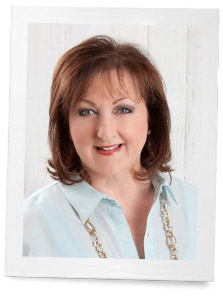 After I married, I got my first chance at owning my own home and my love affair with interior design began. Mistakes and all! But, it is with our current home in Rye, New York that I have had the greatest opportunity to put my mark on a house…making it a home. The interiors have been fun to decorate and update, but it is the exterior of the house that really makes me happy. Our outdoor pots are decorated to fit the season. There is usually a wreath or some type of decor on my door and I’ll even dress up my adirondack chairs if the weather is nice. But, my favorite season is Spring and I relate most to my pink tulips. Peeking out my bedroom window each morning to see how many more have bloomed is a common way to start my day. Yet, tulips aren’t just for gardening. They have begun to infiltrate design….from wallpaper, to art, to chair and table styles, china and stationery. 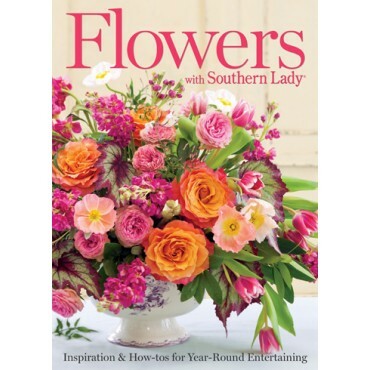 Order Your Copy of Flowers with Southern Lady Today! I just came across this article and want to say your flowers are beautiful! Your home too! Very classy! Looks so happy and cozy! I love the tulips! Just lovely! Gorgeous! I live in Florida and tulips won’t grow here. Your home is so beautiful. Thanks for sharing it with us! Elizabeth has such grace and style. Such a wonderful gift to see them in time for Mother’s Day ~ the tulips are gorgeous! Stunning display! This spring the tulips seemed even more beautiful as if to reward us for enduring a very harsh winter. i too, love pink! So lovely to hear from sweet Elizabeth. Love the thought that tulips are nature’s exclamation points! Elizabeth has such a way of making her home and life beautiful, how interesting to hear some back story on why it’s so important to her. Thanks to you both for a wonderful post. 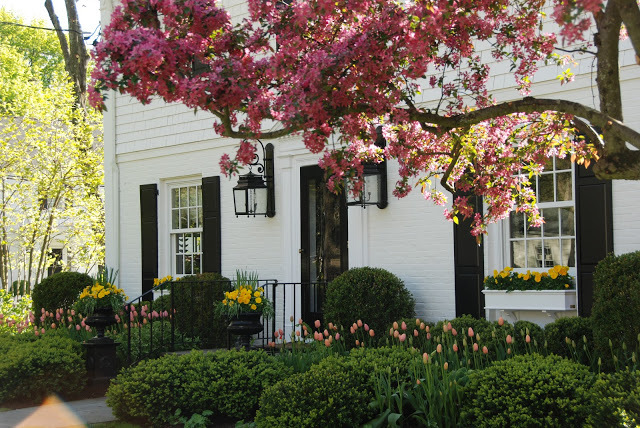 Elizabeth is a favorite of ours as is her home – both full of charm, and we adore her tulips! Hope you’re having a wonderful week! Tulips are my fav flower too — we have yellow – but your pinks are just gorgeous! Thank you to Phyllis for inviting me to share my story and my tulips with all her wonderful readers!! I have found a kindred spirit in her and am so inspired by the beautiful world she has created for us all to enjoy! I love your post. You bring happiness to everyone with your beautiful inspirations for daily living! I was just looking at a tulip and daffodil catalog from a bulb company that I received two weeks ago. I was just going to place an order for purple, orange and white. The tulips and daffs are done blooming here. The apple blossoms and magnolias are boom now and Irises are starting too. My favorite will always be the tulip. Thanks for sharing. Torally agree! Elizabeth is amazing!! Thank you for sharing these pictures of your home, just lovely. Gorgeous! But, where have I been to not know you lived in Rye, NY???? Hey Junaid i think my wi-fi prob.has been solved.yesterday i called Samsung customer support they told me to do settings in wi-fi..i hve changed some settings manually and from that onwards my wi-fi is working fine..lets see this settings works fine for me.. The pink tulips are so beautiful and the colors are so soft and complementary to your lovely home: classic elegance!. I love your home! Out here in south-east Canada (just slightly north of your north-west:) our tulips are done blooming, and we are seeing lilacs and dogwoods blooming profusely! I’m spending each spare moment in my garden. I live in NY for 3 yrs. I visited the capital,Albany,I never seem so many tulips in my life. I too live in Texas(Austin). We have our season. I love all kinds of cut flowers. 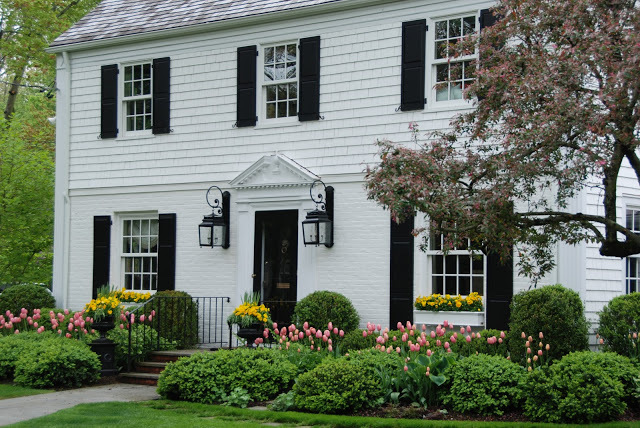 i love how you tucked in the tulips among the more formal landscaping. very prettily done, madam! What a beautiful blessing to see all of your spring tulips! I live in Colorado and we are still having snow. My tulips are buried. How fortunate you are to have such a wonderful garden. Absolutely stunning. we were in upstate NY recently and saw many tulips about ready to open and a few in their full glory ! I too live in Madison, WI – glad to see the tulips and all spring flowers finally in bloom. My neighbor is trying to figure out why the squirrels like to dig up HER bulbs and replant them in my yard!!! here in madison wisconsin the spring has had a late start and the daffodils and the tulips are now out tho… love all the different seasons …..